Looking at the weather forecast, it is supposed to warm up significantly next weekend so I will wait until then to do more work on the VX. Yay! I got my Curt Hitch installed today! As with most things, this did not go as smoothly as I had hoped. It was a fight to the bitter end, but I did it! So glad to get that thing out of the laundry room, my wife was getting worried I would never put it on. No light connector yet, but the hard part is over. Yay! Yep. Looks like mine. Now get a superbumper. Some Mother's Back-to-Black and 15-30 minutes will make that cladding look amazing, btw. It lasts several months. Keeps it looking nice and fresh until you find something better. It's what I have on mine. Kat & Jo convinced me that something on the back was a good idea. And frankly, if a VX gets rear ended, it's going to be totaled--that's a repair nobody wants to touch. So I have protection from frame damage, whiplash, and it may actually keep people from tailgating as close...i don't honestly know! 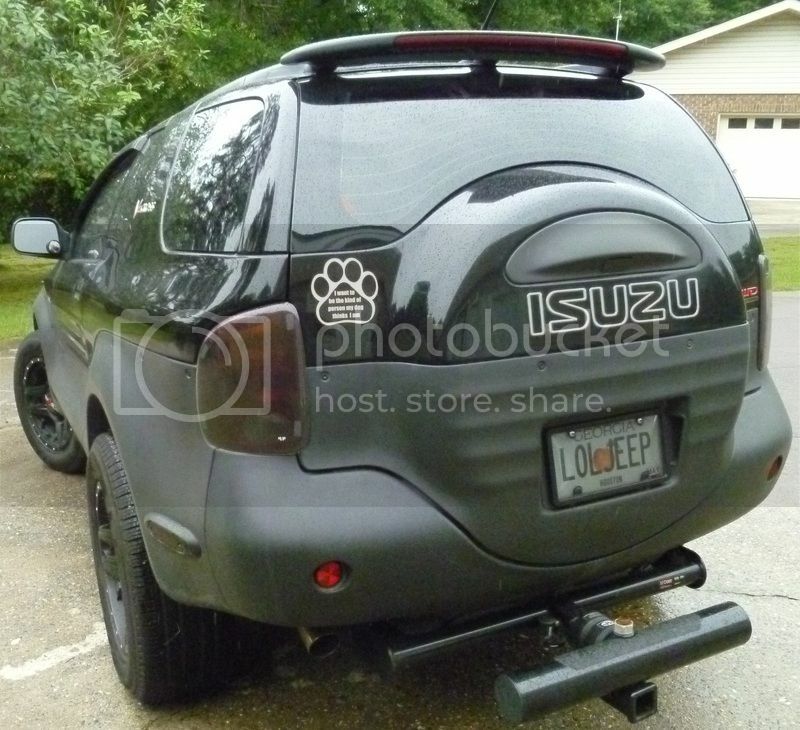 I actually don't see the original Superbumper (that I have) but they do have the spare bumper which does the same thing, minus the mount for a receiver hitch. Lifetime Warranty; it gets destroyed in an accident, you send it back with a copy of the police report & they ship you a new one free. It was a nice day today. I would have rather been out driving the VX, but I decided to work on it instead. This time I was attempting to fix the passenger side window. It did have a bad motor so I changed that easily enough. However, I discovered I also have the tilt issue. Until I fix that, the window will have to stay up. Otherwise I may not get it closed again. Spent the rest of the day working on the wife’s Kia. Just general service, but needed to be done. The VX continues to vex me. With all of the issues I am currently looking to sort out, the transmission has reared its head. For the third time since fixing it, (a few months ago) it has slipped out of gear when shifting from 2nd to 3rd. I am thinking the solenoid. Since I have to drop the pan to get to them, I think I will modify the pan and a universal transmission dip stick to the pan as well. Hopefully I can get to this soon. So after a lot of googling, and even asking around on the FB page, I finally found this thread. The problems are exactly what mine transmission is currently doing. The last page has a link to parts, and really I can’t get them cheaper. Not even on rock auto. It’s called a Master Solenoid Kit and is only $149. I will get that on order today. I also have a 4 day weekend coming up for Presidents Day, which will give me the time to get it done. The things we do for love ... LOL! After mor googling, I have found 4 of the 5 solenoids easy to get to. #5 however looks to be a pain. It is the torque converter lockup solenoid, and it is actually inside the transmission, not just behind a pan. From what I could find out you need to drop a plate just behind the pan. But you need to be careful because of parts that literally balance as you drop the plate. You need to keep these lined up so you know how to put it back together again. Also there is a gasket for this lower plate that I do not know the name of. After calming down I stopped by a Jeep/Off-road shop today to see about an complete engine rebuild. They are going to get back with me sometime tomorrow with a quote. The nice thing is that the guy knows Isuzu and has a trooper at the shop waiting for a transmission replacement. If the price is right I will most likely pull the trigger on this. Seems like a pretty big leap to engine rebuild...especially after the solonoid thing. Did you mean trans rebuild? Rough idling can be one of several things without warranting a rebuild. First few things off the top of my head would be intake gasket, FPR, plugs, vacuum leak (especially after r/r the intake), and O2 sensor. Exactly why I am looking for a rebuild. I am tired of fixing the same issues repeatedly. The way I see it, the engine made it 170,000 miles and now it is one problem after another. The EGR code is back, despite a new EGR valve, new intake gasket, new vacuums lines, new throttle body gasket, and a lot more. I did an oil change around 2000 miles ago and the oil is already back sludge, which is probably causing the rough idle by clogging the oil passages. In order to clean all of that out properly I will need to pull the heads, so why not just rebuild it and hot tank the block at this point? I can chase small fixes forever or I can just fix it right. For the transmission, my solenoids came in today and I will try that before having the transmission rebuilt. Even if it works though, I will probably have it and the transfer case rebuilt at some point anyway. All this may be overkill, but I need this Vehicross to be reliable as I plan on taking it to some very remote places. I can’t do that if new issues keep cropping up before I get the current ones under control. At some point I will also need to get the ABS module rebuilt/replaced as well. I have already swapped the entire suspension, rebuilt all of the brake calipers and new pads, rebuilt or replaced the entire front end except gears, and those are just the large items. This VX was abused and not cared for at all. I didn’t realize the level of neglect this truck had been through when I purchased it. But, as they say, in for a penny in for a pound. Yeah, I'd wager that the PM was completely neglected. I HIGHLY recommend Shell Rotella T6 full synethetic for oil. The reason is because diesel oils do not have the same restrictions on cleaning agents that "regular" oils do--so their cleaning agents will last longer between oil changes. For an engine that has been neglected, those cleaning agents may be entirely consumed in the first 1000 miles--at least with a regular oil. I change mine religiously at 3,000; have done it for several vehicles now--and it works great. I don't buy the hype about longer change intervals. The ONE thing I'd verify if they do a rebuild on your engine--is the oil squirters & passageways. There's a reason OEM engines tend to burn oil--and I can state factually that my own engine does not. I'm not sure if it's a rebuild--but I wouldn't be surprised. Unfortunately, you're also seeing one of the issues I've seen some of my car buddies run into by trying to buy on the cheap end of the market. That Corvette that is selling for 5 grand less than any other comparable model--is probably beat to tar. Fortunately, you're a handyman & can address problems yourself. There are many who aren't nearly as skilled--and they quickly realize that buying on the cheap end of the spectrum--in order to afford a vehicle they probably shouldn't afford in the first place--is a losing proposition. Kind of like how thinking you're approved for a $200,000 mortgage doesn't mean that you can or should AFFORD said mortgage. Best of luck to you! Keep us informed.